After a day of trekking into the Amazon Jungle I returned to the Amazon Tupana Lodge for lunch and a swim in the river. 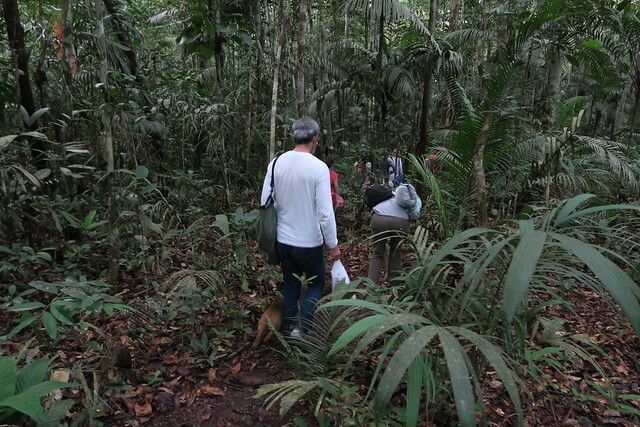 At 1630, with no piranha bites on me I was ready to depart for the jungle again. 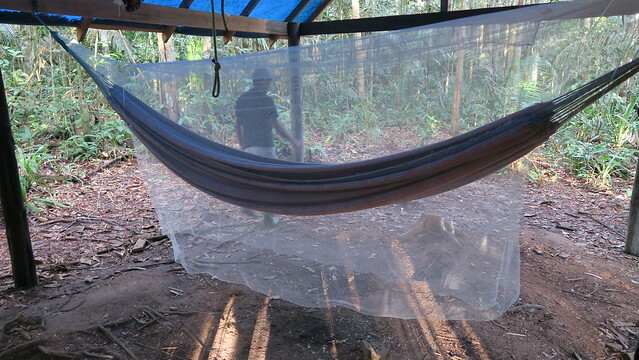 I collected a hammock and placed it in my backpack, just in case I decided to camp overnight in the jungle. Up until this point I still hadn’t made a decision. The ladies at the lodge served us some slices of watermelon. 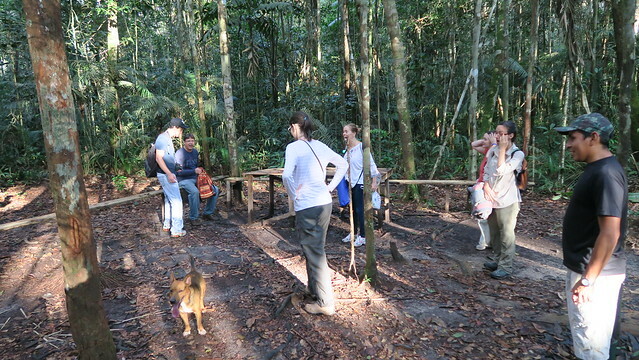 We then hiked for 35 minutes to the camping area in the jungle. There was a table in the clearing for us to eat at and a shelter (with no walls) for us to setup our hammocks in. While the others (5 people from our group) were setting up their hammocks I finally decided to camp with them. 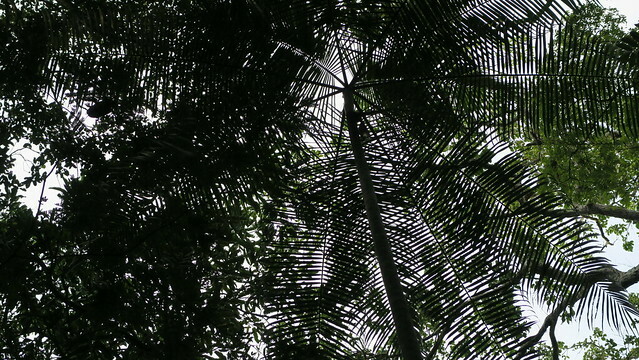 There are no toilets in the rainforest. Just trees and lots of plants to give you some privacy. Well, I was more concerned about Anacondas and other creatures. 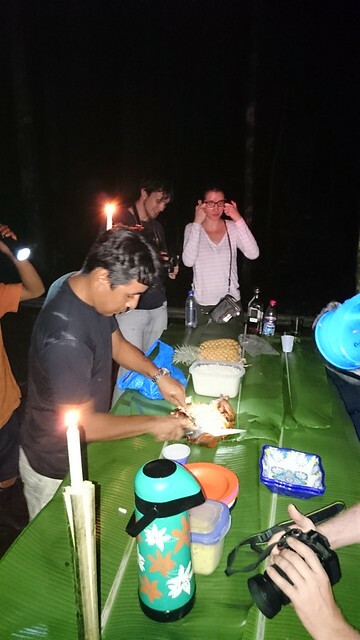 We then waited at the table while the 2 guides (the English and Portuguese speaking guides) chopped wood for the fire, made a simple banana leaf table cloth and tied chicken to sticks to grill over the fire. It took almost 2 hours before the chicken was ready. Since it wasn’t halal I just ate some pineapple slices and the energy bars that I carried. By 9:30pm 3 members of the group left with Robinson, the English speaking guide. 5 of us and Jamiu (the local Portuguese guide) would remain at camp. 1.5 hours later I was the first to head to my hammock. 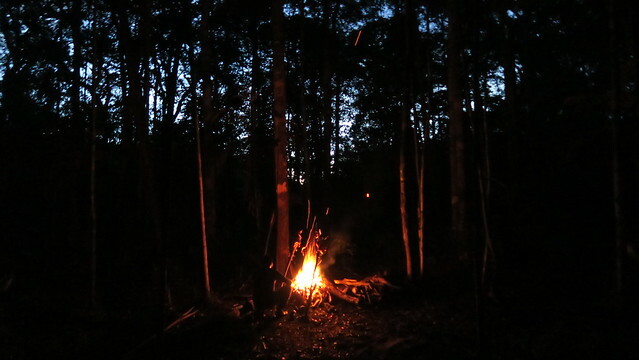 I applied extra insect and mosquito repellent to my clothes and body, used my rain coat to cover a hole in the mosquito net, changed into a dry short sleeve shirt and got into my hammock with a bottle of water; with a can of mosquito repellent and my cap. My head wasn’t comfortable in the hammock so I ended up using the water bottle and can of repellent under my neck as a pillow. The others in the group retired to their hammocks about 30 minutes later. I awoke at 0130am feeling cold. Specifically on my arms and hands. All I had in the hammock to cover just one of my hands was my cap. I just didn’t feel like getting out of the hammock at that time of night. There was lots of noise from the creatures in the jungle. 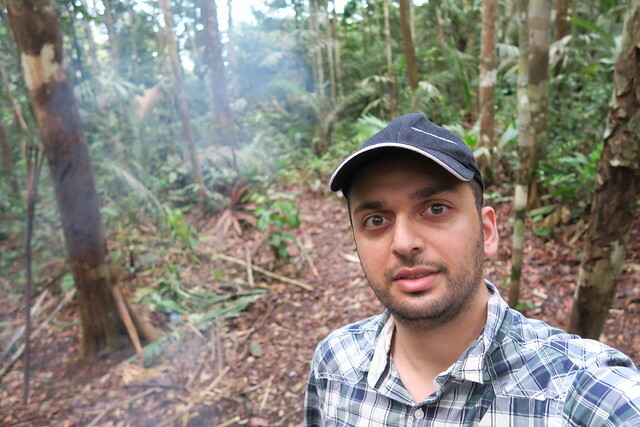 At times you could also hear the generator at Amazon Tupana Lodge, approximately 2km away. Some of the noises were inexplicable. I thought I heard some drum beats with music at some point. I did feel safe with Hex the lodge’s dog sleeping beside us. Correctly or not, I’d assume that he’s alert and save us from any nasty creatures that may want to attack us at night. We trekked back to the lodge 20 minutes later, and reached our rooms at 0655 am. The first thing I did was recharge my cameras before the lodges generator shut off at 0730 am. I then had a quick shower and lied down for a few minutes before breakfast and a new day full of activities. Too bad they didn’t accommodate your dietary needs, but the experience of camping in Amazon seems to have been worth it in the end! This is really enthralling. 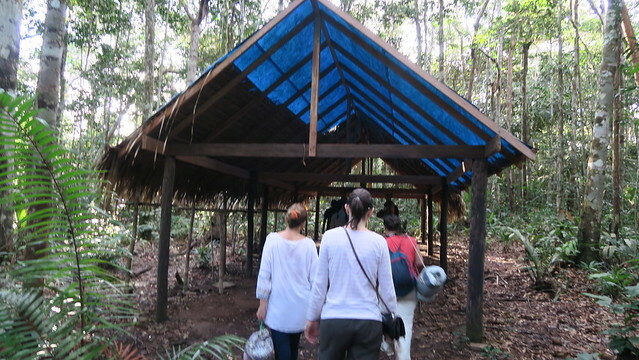 Can’t wait to experience my own Amazon adventure and possibly document as you have here. Great work Zaid.